Consider seat height carefully when shopping for school chairs. A chair that is too small or too big is uncomfortable and distracting for students. Make sure to check the seat height and its compatibility with the ages and sizes of your students before purchasing. For example, a standard adult chair, which we recommend for 5th graders through adults, measures 17.5-18 inches from the floor to the top of the seat. Chairs are also available for the smallest students; a five-inch seat height is a great choice for children as young as one year old. Use the chart below to determine the correct chair size for your students. If you're unsure of which size to order, we recommend the larger size in the suggested range. After all, students continue to grow throughout the school year. We recommend ordering the size that will fit 75-100% of your students. Our friendly sales team is also happy to help you order the appropriate size. Call 1-800-260-2776 to speak with an expert. If you are buying a chair for a particular child and want a precise fit, measure the child's leg from the floor to the bend at his or her knee. Get a chair with a seat height that is closest to this measurement. Note: To ensure your new chairs work comfortably with desks and tables, order desks and tables with a tabletop height eight to 12 inches higher than the seat height of your chairs. Stack Chairs are what people usually think of when they picture school chairs. These chairs easily stack one on top of the other, making it easy to store them. They also conveniently stack on top of desks, allowing easy cleaning of classroom floors. These chairs come in a variety of materials including polypropylene, steel and solid hardwood. They feature glides that prevent scratches on school floors. Ladder Back Chairs are commonly found in libraries, but serve equally well in a classroom. Typically constructed of solid hardwood, these chairs feature horizontal bars on the back of the chair. Ladder back chairs generally do not stack. They complement the décor of many spaces, and lend a classic look to your classroom. 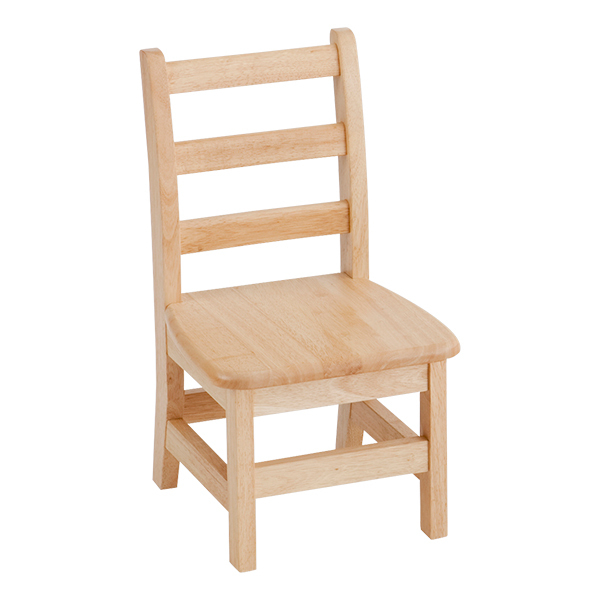 Most ladder back chairs on this site feature environmentally-friendly natural finishes. Rocking Chairs provide a great place to read a book or relax between lessons. Rocking chairs come with and without arms. Use rocking chairs in your classroom's reading area. Plastic — Most preschool stack chairs have an easy-to-clean plastic seat — polypropylene, polyethylene or plastic resin. These long-lasting materials make lightweight, durable seats that last for years. Polypropylene flexes as students move in their seats, improving comfort. Plastic resin flexes less, but its rigidity provides increased durability. Most plastic seats feature tubular steel legs. Steel — While few seats feature steel chairs, most have steel legs. Steel legs provide durable structure and long-lasting support. Most steel legs also feature coatings for enhanced durability and rust prevention. Chairs on this site feature either powder-coated or chrome finishes. The thickness of steel is measured in gauge; the higher the gauge number, the thinner the steel. Hardwood — Solid hardwood creates heavy, durable chairs that last for years and support plenty of weight. Attractive, natural wood finishes enhance the look of your space. Most hardwood chairs are either ladder back or rocking chairs. Preschool chairs come in a wide variety of fun colors that you can mix and match to create a cheerful learning environment. Many chair colors coordinate with activity tables made by the same manufacturer. Create a coordinated look by purchasing preschool activity tables that match your preschool classroom chairs. Browse our selection of preschool activity tables. 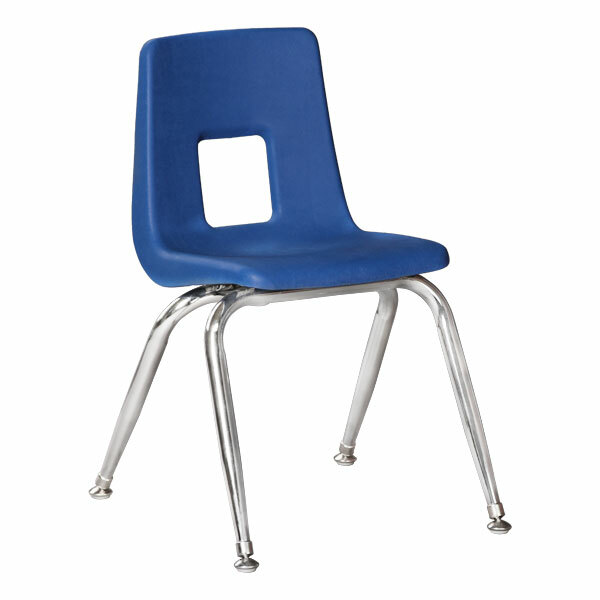 Check out our selection of preschool classroom chairs. Still not sure which seat height is right for your early learning students? Give us a call at 1-800-260-2776. Our friendly sales consultants know all about school chairs and are happy to help.